I'm trying to make a more pyroclastic cloud but it seems I cannot get hard edges. I have only one Fractal4D and it is sharp between the two colors and still my result is a mix between sharp and blurry around each particle. Know what I do wrong? Still no answer, did you try my problem on your side? Ok, the contrast min/max sliders in the fractal are very close to each other to get a fast falloff? The example above is still a bit soft on the edge, the other example is the sponge scene in v3.0. But a harder egde than those samples are probably not possible. You definately have to enable normal shading, I would suggest the lambert shading type. 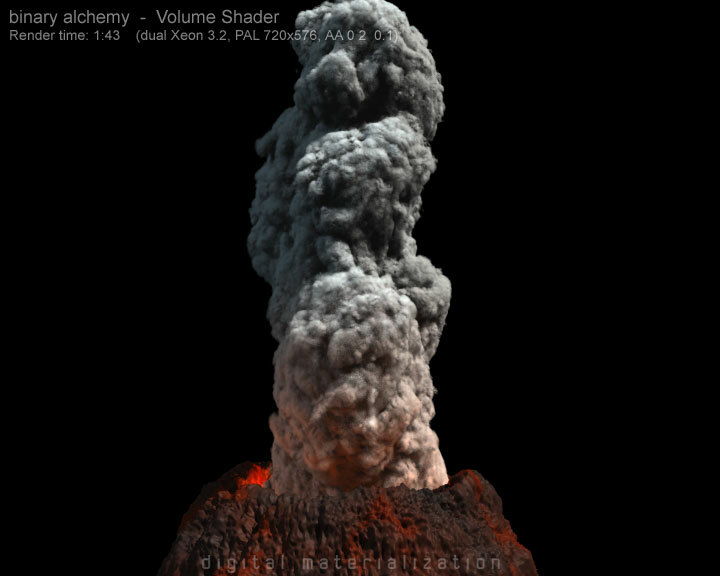 Then you can try to increase the contrast on the first site of the in the volume shader PPG. And you will get flickering as you probably won't get that small cell sizes, so you should try full raytrace like in the sponge sample scene.